As you research and blog on historic and other topics, think about publishing some of your ideas as articles in local newspapers or magazines. Many newspapers and magazines have freelance spots for well-written articles and carefully researched historical pieces. They may be welcome in the Views section, Local Color, Around the State, Travel, or History sections, to name a few. Whether they pay or not, a good byline is worth its salt. Or should I say ink? Last fall, our local Anderson, South Carolina, newspaper accepted and published one of my blogging topics in its entirety and with pictures in a Sunday edition. Surprisingly, they gave it a full page. Most importantly, they gave me a great byline with my photo included. Here's the story on how this came about last September. 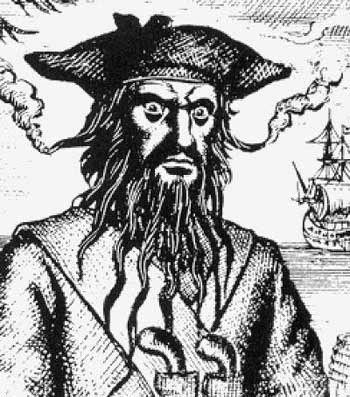 As I was blogging on the pirate era for my current inspirational novel, it occurred to me our newspaper just might like an expanded article relating to one of my subjects, Blackbeard, also known as Edward Teach. The fall of the year is a great time for pirate stories as this most famous one of all met his demise in the month of November in 1718 at the hand of Lietenant Robert Maynard and his marines. This violent battle took place at sea near the pirate's hideout at Ocracoke, North Carolina. I unearthed quite a few details I thought would interest newspaper readers, such as: Blackbeard was wounded an astounding 25 times - 20 cutlass wounds and five gunshot wounds - before he succumbed. Also, Maynard reportedly chopped off Blackbeard's head and attached it to his mast before sailing home. Legend has it that when they threw the pirate's body overboard, it swam around the boat seven times before sinking. So how did I pitch the newspaper my "timely" story? I knew one writer at the newspaper fairly well. She had attended one of our writers' workshops. I gave her a call and asked if she thought the newspaper might be interested in a freelance article on Blackbeard. She thought it likely since I had a ghostly legend as the subject and Halloween season was around the corner. She gave me the name of the editor to whom I should submit, so I emailed the article with some pirate pictures from my file and an accompanying note asking the editor to evaluate whether my submission had any merit. That editor contacted me the next day, a Friday, and said they wanted to use it in Sunday's edition. She asked for my research sources and a photo of me to go with my byline. Of course, I had all that ready to go. The printed the article in the Sunday Views section with very little change and one of my pirate pictures. They quoted all my resources. There was no pay, but I was happy to get the full byline. Be assured, there can be money in historical pieces. This Blackbeard story, in slightly revised versions, has been published in three newspapers. The first time it was published in a larger newspaper's magazine yielded a welcome check of $150. Have you turned any of your research into article for publication? Do you have a question? I'll be glad to help in any way I can. Thanks for dropping by our blog. And please leave a comment, tweet, or share this on Facebook. Elva Cobb Martin is president of the South Carolina Chapter of American Christian Fiction Writers. She is a former school teacher and a graduate of Anderson University and Erskine College. Decision, Charisma, and Home Life have published her articles. She has completed two inspirational romances. In a Pirate's Debt is currently being considered by a literary agency for representation, and Summer of Deception is being considered by a publisher. A mother finally promoted to grandmother, Elva lives with her husband, Dwayne, and a mini-dachsund writing helper (Lucy) in Anderson, South Carolina. She and her husband are retired ministers. Connect with her on her web site at www.elvamartin.com or via Twitter @Elvacobbmartin or Facebook.